A man has been hospitalised after a group of “up to ten men” forcibly removed tenants from an apartment in Dublin this morning. 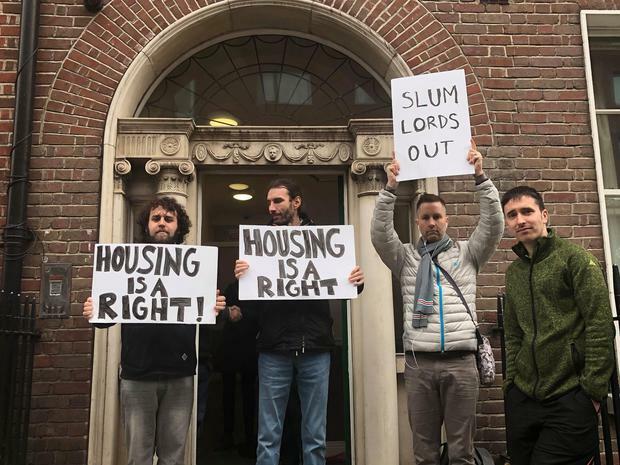 The men are now occupying the apartment in Mountjoy Square and friends of the tenants and other residents in the building are protesting outside. It is understood the tenant taken to hospital suffered bruising to his ribs after he was dragged out of the apartment. 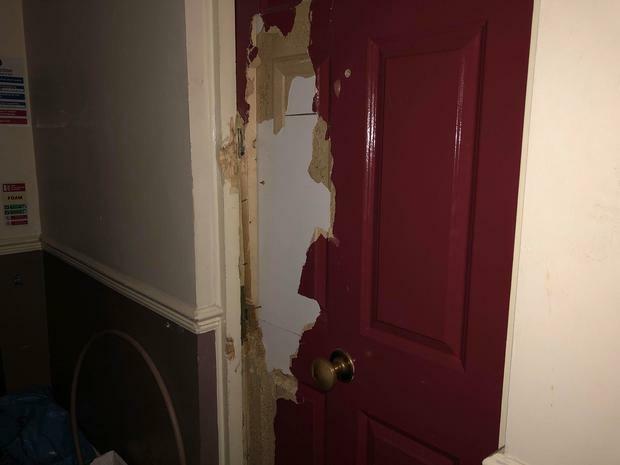 Pictures below show the damage done to the door after the men forced their way in at around 10am this morning. "We were in bed and we heard a load of banging this morning, it was like a sledgehammer banging off something. 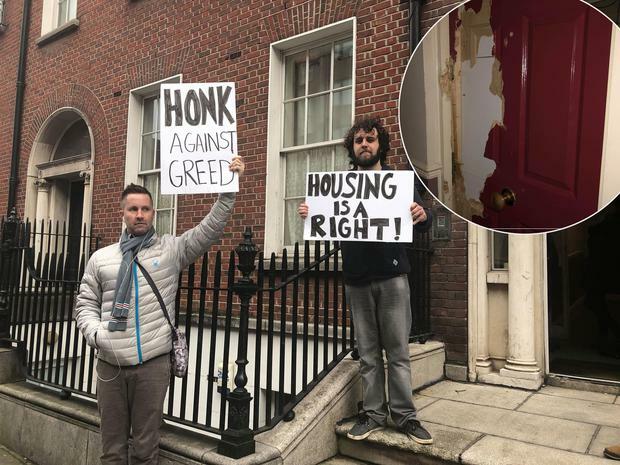 Then there was a load of commotion and the tenants were all outside in the hallway in their pyjamas after being dragged out," one resident of the building told Independent.ie. "There were around 10 heavies and they have now locked themselves inside," he added. Six tenants had been sharing the apartment in Mountjoy Square. The High Court issued an injunction before Christmas blocking the landlord, Paul Howard, from evicting the tenants until the termination of the dispute resolution proceedings with the Residential Tenancies Board. It is alleged that Mr Howard sought to increase the rent by more than the permissible amount as the apartment is in a designated rent pressure zone. The tenants lodged disputes at the RTB in relation to this and their cases were heard in January. The outcome of these proceedings have not yet been finalised, a spokesman for the RTB said. Gardaí were called to the scene this morning and are making enquiries in relation to the incident. A spokesman told Independent.ie that no arrests were made and "any matters or reported allegations arising from the incident will be fully and thoroughly investigated." The men occupying the apartment did not respond when asked for comment. Paul Howard has had previous orders issued against him by the RTB for retaining tenants' deposits and unlawfully terminating tenancies. In May 2017, he was ordered to pay three tenants a total sum of €7,694 for terminating their tenancies and retaining their deposits after he rented them an apartment in Mountjoy Square. In July 2016, he was ordered to pay another three tenants the total sum of €5,300 after he unjustifiably retained their security deposits in respect of a property in Kilnamanagh, Dublin 24. Michelle Connolly, of Dublin Central Housing Action, said they "will continue to fight to protect the tenants' rights." "We have been working with these tenants for about three months and they have gone through an awful lot. No tenant should have to go through this," she said. 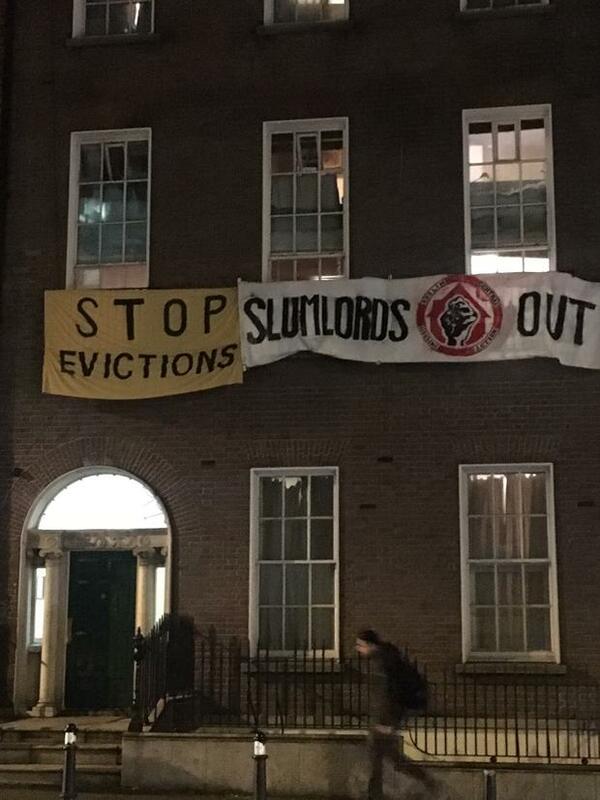 The tenants, together with members of Dublin Central Housing Action, hung banners from the apartment windows saying "stop evictions" last month. The banners were removed this morning. Mr Howard could not be reached for comment.